When my mother turned 70, she and my father were still living in Africa. I went to see her as a surprise. Her birthday was in late January at the height of the rainy season, and in Zimbabwe the rainy season means wild tropical storms with thunder and lightning and a massive downpour, almost every afternoon. Sometimes, but less often there are storms at night too, and one such storm happened while I was there. It was pretty scary and reminded of the times when I’d crawled into bed with my mum and dad at during similar storms in my childhood. It was all I could do not to yell out to them that night as well. 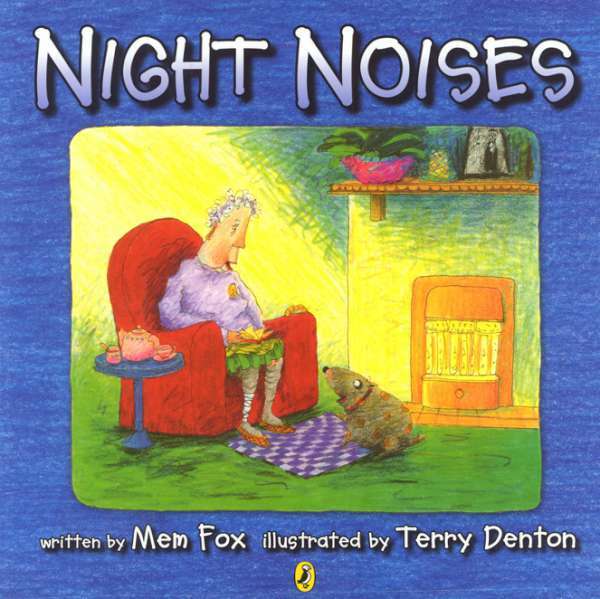 As I lay awake, listening to the frightening wild noises outside, and about my mother’s surprise birthday party, the idea for Night Noises arrived. I made the old lady 20 years older and called her my by husband’s grandmother’s name: Lily, who lived l near a little village in Lincolnshire, England, called Laceby. That’s how names arrive and how Lily Laceby was born. And one of my publishers had an old dog that looked a little like Butch Aggie, though heaven knows where her name from, but I love its unusual-ness, and it’s perfect for this dog. 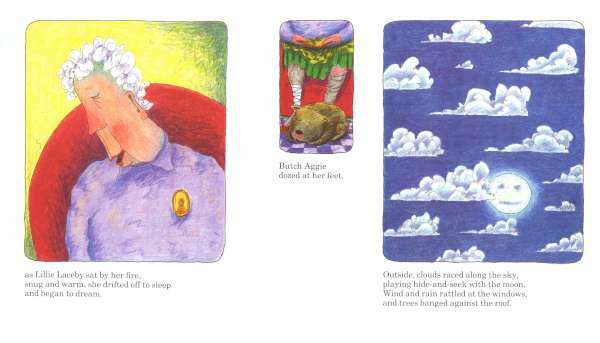 Terry Denton’s illustrations did a wonderful back-story to the text. When you look at the pictures you’ll see Lily Laceby dreaming all the way through, first of her childhood, then of scenes as she’s growing up and growing older until her surprise 90th birthday bursts in upon her. I love getting children to join in on the big red words such as: MURMUR MUTTER, SHHHH, starting very quietly and moving to a crescendo towards the end: BANG! BANG! BANG! I love this book.